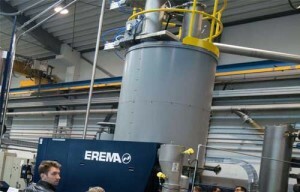 During its Discovery Day on June 1, Erema, Ansfelden, Austria, in collaboration with SIPA of Italy, presented the new recycling system, Xtreme Renew. This system enables the direct and flexible processing of washed PET flakes to produce preforms. “In my experience with customers, the reason why a producer decides in favor of a major investment in a recycling solution is based on a broad-sighted, entrepreneurial approach. Only those companies that are willing and able to adapt will remain in the constantly fluctuating plastics industry in the long term. Thanks to the collaboration with SIPA, we make it possible for plastics producers to show the necessary flexibility,” said Christoph Wöss, Business Development Manager for Bottle Applications at Erema. The cooperation between the two big players in the plastics industry made it possible to develop a direct processing solution. Some 1.2 million tonnes of PET are already recycled every year around the world with Vacurema technology for end products such as preforms for the beverage industry as well as for thermoforming sheet, fibres, strapping, etc. The claim of adaptability applies likewise to the Mulit-Purpose Reactor (MPR) which can be retrofitted to existing extrusion lines. Decontamination, drying, dedusting and crystallization of different PET input materials take place in just one step. As a result, the washed PET material is already food contact compliant prior to extrusion.